Many people say that they are a Minimalist but when you see their backpack, this myth is instantly debunked. There are certain ways to pack a backpack that can be considered as minimalism. Very often it happens that people overpack their backpack because they’re paranoid and think that they “need” multiple changes of clothes or that pair of shoes or that extra fleece jacket. That’s the paranoia speaking and if you listen to it, you end up lugging around a sack of potatoes on your travels, not a backpack. The gist of Minimalism is – take what you actually need – the bare minimum – the basic essentials with which you can survive anywhere. Anything else that doesn’t come to your mind when you think of essential items doesn’t have a place in your backpack. Here are 7 ways a minimalist usually packs their backpack, often, irrespective of the length of the trip. Now, I follow all these methods as well as have seen numerous other backpackers follow them and have found them to be quite helpful. Why don’t you test them out? Don’t try to skimp on the budget while purchasing a backpack and settle for an average one. This item will become a part of your body for the entirety of your trip, choose it well. On average, a 60-liter backpack will be more than enough, but the 80-90 liter ones are more suitable for month-long trekking expeditions in high mountains and freezing temperatures. An extra pair of warm clothes or a raincoat can easily be accommodated in your bag if you have that extra space. Be wise, research a bit and then invest in a good quality rucksack. Mine is a 60-liter bag by Quechua which is sufficient for my current travel needs and cost me just US $52. Other brands that people have recommended me after long term use are The North Face, Deuter, Lowe Alpine, Mammut, Vaude and Osprey. *TIP: If you’re purchasing from India or U.S.A (California), check out the sports apparel store Decathlon, they have authentic brands and there’s always a sale you can take advantage of, I did! It is always better to carry clothes made of “Dri-Fit” material, they absorb the sweat quickly and usually dry within a couple of hours after washing. They are very lightweight and can be neatly rolled up so you will save a lot of space in your backpack; one point for great efficiency! Brands like Quechua, Domyos, The North Face, Jack Wolfskin, Nike and many others make highly durable t-shirts and pants. Make sure that your trekking/hiking pants are made of premium quality material and if possible, come with a tear-away zip to make-do as hiking shorts in case it gets hot. You can also purchase quick-dry towels to make your life on the road simpler. 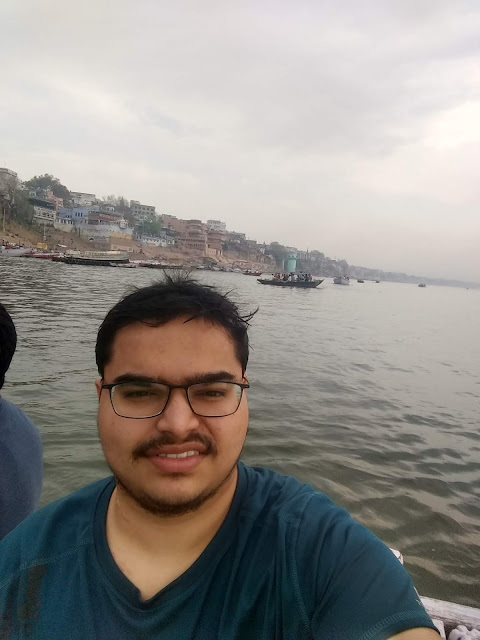 It was quite hot and I took a dip in the Ganges, but my t-shirt & pants dried off within an hour. 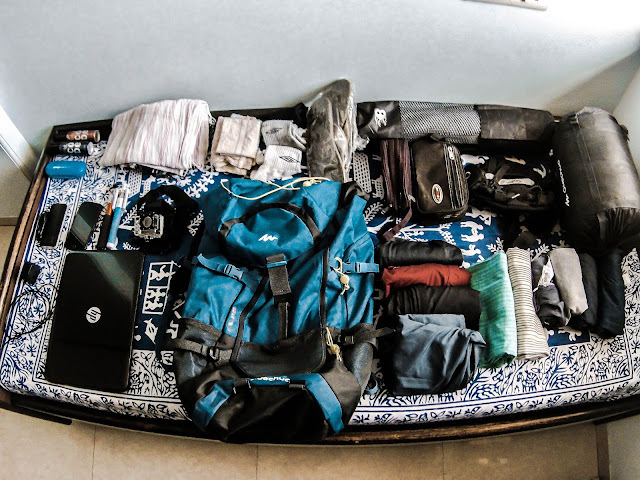 At home, you might be used to folding your clothes and arranging them neatly in your closet, but that won’t be any help while packing for a long backpacking trip. You must learn how to roll your clothes properly and pack them in the bag in an efficient way. 2 pairs of hiking pants, 4 t-shirts, 2 pairs of shorts, 4 pairs of socks, innerwear and your towel must not take more than half the space in your rucksack. That’s what I packed for my short trip to Nepal. I organized my clothes in such a way that it was easy for me to take them out from the top as well as from the front. Every hiking bag has several compartments, make good use of all of them. Keep your medicine and first aid kits in the easy access compartments so you can take them out in case of an emergency. Almost all backpacks have a bottom access feature that opens into the main compartment as well as a bottom compartment, usually provided for shoes; use it! Smaller items like selfie sticks, camera mounts and chargers can be stored in the top or side of the backpack. Many travelers don’t know their own rucksack, which is sad as it will be your closest companion for the entire trip. Yeah, there’s a huge difference between the two. An extra pair of warm/thermal socks or undergarments is a Need, an additional pair or two of jeans or a fancy leather jacket doesn’t qualify as a Need but instead falls under Want. Understand this- minimalism represents efficiency and involves only the essentials, so be efficient and don’t be tempted to “overpack”, else you will feel like a mule carrying all that unnecessary weight on your shoulders and back. I have written a blog about how to manage your budget while traveling, do give it a read. *TIP: Keep a separate budget for miscellaneous expenses (~ $100-$150 should be enough, je crois que oui!) just in case you need to purchase extra pair of socks or maybe rent a jacket or hiking/trekking shoes for a trek. Maybe the correct word is self-sufficient. Even though minimalism means carrying the bare essentials, it is crucial to note that these essentials must help you survive in almost any situation and condition. Swiss knife, fire starter, a cloth line, bungee cords or rope, cloth washing materials- scrub/brush and powder/bar detergent, peanut butter, oats, a loaf of bread, spoon & fork, cup and a plate; these are few of the items that I carry, they don’t take up much space in my backpack and I can get out of most sticky situations with them in my bag. When I was traveling in Nepal, I needed to wash my clothes but according to the rules of the hostel I was staying in, I wasn’t allowed to. The laundry service wasn’t expensive but for a backpacker minimalist like me, that’s simply squandering money. So, I spoke with the owner and decided that I’ll only give my hiking pants and my t-shirt to the laundry and I will wash the smaller clothes by myself. That saved me around 60-80 bucks in local currency, not much but I enjoyed a glass of local rice whiskey with my savings! *TIP: Peanut butter, bread and oats can be lifesavers. I advise many of my friends to carry them as it’s easy to make a PB sandwich and some porridge; a meal that’ll definitely satisfy your hunger for a few hours. These 7 ways are my own personal suggestions as well as those of many whom I’ve met on my travels. The truth is, YOU decide what being a minimalist means to YOU, and then live and travel with the freedom you get with that lifestyle. What are your thoughts about minimalism?